Water sure has come a long way. In the old days, people used to drink water from streams, rivers or wells. Then along came plumbing and people raved about tap water. Then tap water went out of style as Brita filters and bottled water came into fashion. So what's next then? Aged water of course. 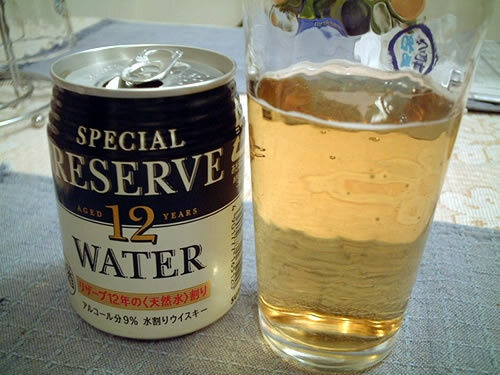 The geniuses over at Suntory Japan decided to pour some water into a bunch of casks, then let it sit around for a good 12 years before selling it at your local convenience store. Some things improve with age, like wine, cheese and beef, and it seems that water is now on the list as well! 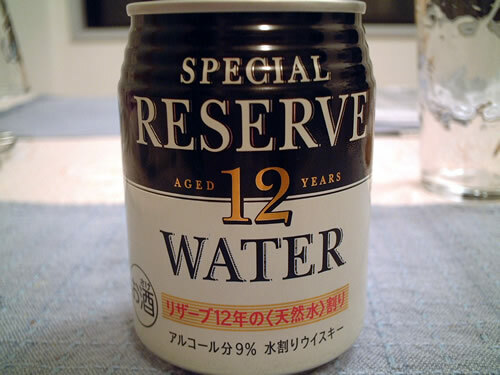 So what happens to water after 12 years? Amazingly enough, it becomes alcoholic! People have always been so busy making alcohol with grapes or barley, etc, I guess it never occured to anyone that you could just forget about stuff like that and let water ferment all by itself. At 9% alcohol no less, it's looking like the invention of the century! That brownish tinge is something of a turnoff though, but after 12 years of sitting in an oaken cask or whatever, I suppose you can't really expect water to look like water anymore, right? Ok, let's give it a try. Hmm, it's the weirdest thing, but it kind of tastes like whisky a little bit. You don't suppose that they.... Naaaah. Have you ever known Japanese companies to make silly label mistakes? Anyway wow! I just find it so hard to believe that no one ever thought of trying this before. People who say that everything's already been done sure haven't spent any time in Japan! What'll they think of next?